Richard’s fretboard fireworks will melt your heartstrings, have your toes tapping and your jaws hanging open. His ever growing repertoire comprises a wide variety of music from classical Bach to Beatles pop. It includes Scott Joplin Rags just like Sousa marches, Chopin, Mozart and fiddle tunes. It ranges from jazz standards to Chet Atkins and Jerry Reed and to Django Reinhardt gypsy swing, not to mention their intriguing originals. When Richard Smith picks up a guitar, it's a treat for the ears and the eyes. Audiences watch in amazement, while his fingers dance over fretboard and strings, and listen in delight, as melody and groove fill the room. It's a natural gift. Born in Beckenham, Kent in England in 1971, he started playing on a six-string at the age of 5 after hearing his father picking “Down South Blues” by Chet Atkins and Merle Travis. When Richard asked “Dad, how do you do that?”, his father obliged, and Richard never looked back. Often, a single hearing was all it took to get a piece under his fingers, and eventually his hero, the “Godfather” of fingerstyle, Chet Atkins, invited Richard to share the stage with him at Her Majesty's Theatre in London, when he was only eleven years old. 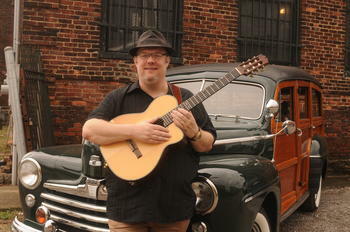 After studying the music of Atkins, Travis, and Jerry Reed, Richard soon graduated to classical guitar pieces, Gypsy jazz, poppin’ tele playing, bluegrass and bebop licks by listening to an array of recordings by the likes of Django Reinhardt, Joe Pass, Doc Watson, Newgrass Revival, Albert Lee, Jorge Morel, and countless other virtuoso musicians. With his brothers Rob and Sam he formed the Richard Smith Guitar Trio for about 8 years. Having married American cellist Julie Adams, he moved to Nashville in 2000. Since then, he has toured constantly around the US and Europe either solo, with his cellist wife, and with his swing band The Hot Club of Nashville. With 10 CD releases and two DVDs to his name, and concentrating mainly on a solo career, Richard is well-known for mixing it up and playing a wide range of musical styles using various techniques. Blues, Joplin Rags, Bach, Chopin, flatpicking fiddle tunes, Sousa Marches, fingerstyle jazz to straight Travis picking tunes make up his evolving repertoire. Nowadays, Richard balances his time between concertizing on the road and lending his ears and licks to other artists' music, producing their records in his very own Tunesmith Studio.